I spent the weekend in Carmel, CA with my family at the Highlands Inn, our favorite Hyatt property in the Golden State. My previous reviews remain relevant, but I do want to draw your attention to a few positive changes at the property. First, the Kenet MD soaps and shampoos have been replaced by Pharmacopia-branded product. That’s a nice upgrade as the Pharmacopia products have a much better scent. Second, there are new bedside clock radios that have both USB charging and 120-volt power plugs. It’s a nice upgrade from the annoying old Apple 30-pin connectors that went out of date several iPhone generations ago. The sad thing is–at least potentially–is that that Apple and others are moving to USB C plugs. Hopefully, this new clock radio will not quickly become obsolete. The room service menu has also been updated and there are now 24/7 options available. We were in our usual bi-level Townhouse Suite and always appreciate the wood-burning fire and beautiful views. We do not have a TV at our house, but my son Augustine knows how to turn the TV on from his visits to my parents’ house. The little fellow found Toy Story 2 all on his own and we decided to let him watch it. He sat transfixed for an hour, meaning it’s time to introduce him to IFE next time we fly. Breakfast remains a highlight and the restaurant staff (Kamiki, Shama, Tony, and William) are so excellent. I love that they have all been there for years. It is a joy to see them each time we return to this property. The hotel is actually nestled in the Carmel Highlands residential neighborhood. My wife and I always love walking through this neighborhood of old homes and mature gardens. Ideally, we will one day be able to come to our own home here instead of the hotel. 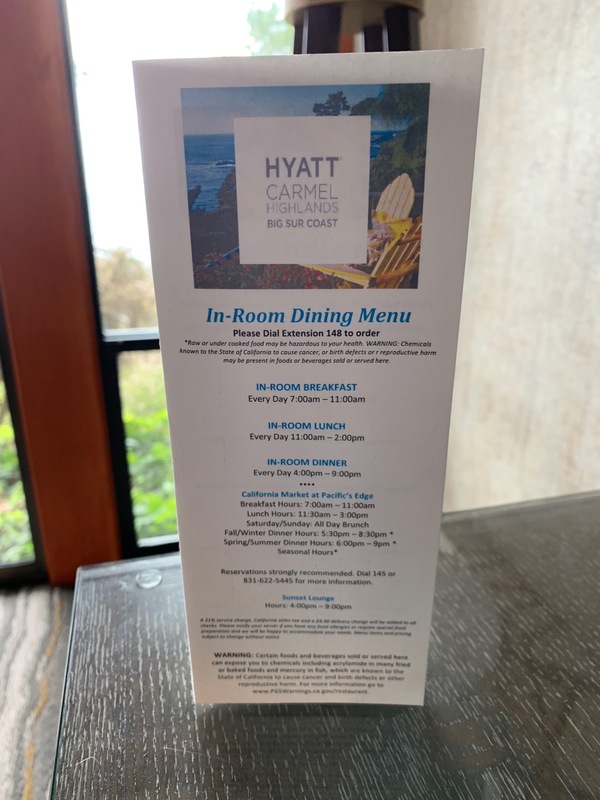 Have you been to the Hyatt Carmel Highlands recently? What are your thoughts on this property? Hi Matt – just to clarify, the bi-level suite is what you get using your Suite Upgrade Certificate? Or are they just always nice and upgrade you as a Globalist courtesy, no certificate needed? While I have received this on a complimentary basis before, I never chance it anymore and always use a confirmed suite upgrade. The Globalist suite is indeed the two-story Townhouse Spa Suite. Augustine is getting so big! He is a beautiful kid! What a blog rock star! Thanks for sharing the precious pics, your feet included! Thanks, Mike. Augustine is getting big quickly and talking up a storm. Such a great time of life. Any expansion (or separate post) on the “we don’t have tv at the house” segment would be interesting. And tell your new “gramma” it’s “parents'”. Plural + apostrophe. Unless sadly you only have one. Lovely post. I’ve become a regular. Parents’ indeed. Thank you. I’m thankful that both my parents are alive and very much a part of Augustine’s life. I have nothing against TVs personally nor do I think there is anything morally wrong with TVs or movies. But I run three companies (Live and Let’s Fly, Award Expert, and my import/export company) and my wife is running the household while earning an advanced degree. There is simply no time for TV right now and we don’t even want the temptation. If we really need to watch something we can tune in on our laptops and I certainly watch more than a fair share of movies on airplanes. As for Augustine, we want to encourage him to read and sing and exercise instead of being a little couch potato. He also doesn’t get any sweets beyond fruit…he has no idea how good cake and cookies are. There will be time for that later, but the little guy loves to eat vegetables. How rare is that? He sounds like a little rock star indeed. Also, great parenting there; sugar is one of the most addictive substances there is and I sometimes wish I hadn’t been exposed to it from young. It’s so hard to give up sugary foods later in life once you’ve grown accustomed to it! Just a question will he later get weed cakes?? Fell bad for him They are awesome !!!!!! My parents moved to Carmel in 1944 and as a child I was often taken to the Highlands Inn for special-occasion meals, so my memories of the hotel go way back to the mid-1950’s. This was never considered a great property by locals; as you said, it’s all about the view. In the evening we often drove down the coast to Nepenthe (which opened in 1949 – the year I was born). In addition to its restaurant, there was a large outdoor fire pit next to a patio where ‘grown-ups’ danced at night. One evening my mother urged my father to ask the actress Kim Novak to dance. She lived nearby, had just gone through a divorce, and was at Nepenthe by herself. My mother said “She’s lonely. Go ask her to dance.” Dad did ask. Kim said yes. And afterwards the actress came and sat for a while with our family in front of the fire. It’s one of my favorite childhood memories. Great comment. Thanks so much for sharing this special memory. Really like your posts, values, and observations.